While there's plenty of free stuff to do outside, rainy days are much better if you're budgeting. Keeping kids entertained in the house is easy. Aside from DVD marathons and family baking sessions, another great way to keep little ones entertained is by indulging their artistic side. 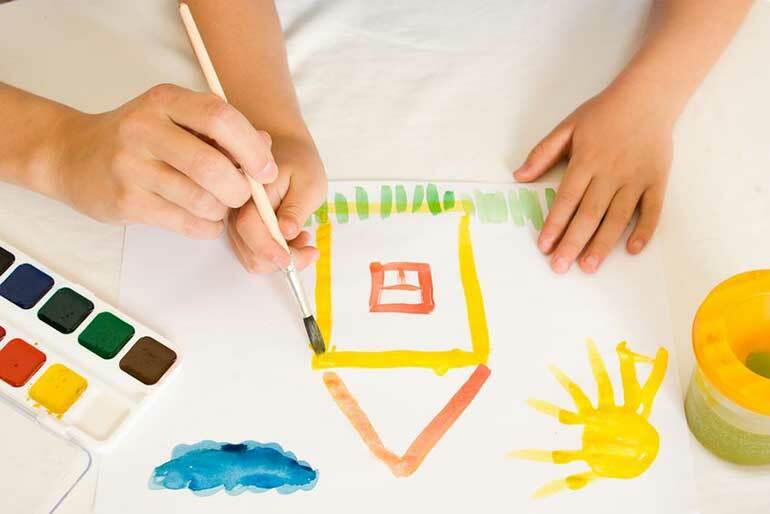 Kids love crafts, and you don't need loads of expensive materials to have fun, either. It's a good idea to keep a craft box in the cupboard for rainy days. Stock it with the usual craft supplies: stick glue, paints, glitter, coloured card, crayons, wool, and so on. Try not to spend too much money stocking the box: you can keep track of your finances with our free Money Dashboard money management software if you want to make sure you're on the right track. You can top the box up with odds and ends like paper plates, spare buttons, and cava corks: you'd be surprised what sorts of things come in handy when you're crafting. You can pick up 100g of assorted buttons at Hobbycraft for £1. If you save the spare buttons when you buy coats and shirts, then you can use these instead. Lay your buttons down in the order that you want them to be in once they're in the bracelet: you can alternate two different colours, or mix the colours up for a rainbow bracelet. The buttons should overlap slightly. Thread the elastic through the first button, then the one underneath, then back through to the next button in the row. Keep going until you have enough buttons to fit around your wrist. Tie the elastic at the end in a knot, and you're done. Ikea sell silicone ice cube trays in a range of fun shapes for 95p, and these work perfectly for this project. Not only is this a fun craft project, it also means saving money on crayons in the future. Start by taking any unloved old crayon ends and peeling the paper from them. With some brands it comes off easily, but if you're having trouble, try peeling them like you would a vegetable. Sort the crayons by colour, break them into small pieces, and put them in the moulds. Bake them in the oven at 100°C for around 20 minutes. Leave them to cool and harden before popping them out for some colouring. Start by cutting a square ‘window' out of each side of the carton for the birds to feed from: this should start roughly halfway up the carton. The birds need perches, so make a small hole halfway between each window and the bottom of the carton, and poke the twigs through. Poke a couple of holes in the top of the carton and thread the garden string through: this is for hanging the feeder up. Finally, fill the feeder with the bird seed until it's just level with the window. Hang it outside and watch the birds flock to your garden.